An asteroid – Ardor – is set to pass through our orbit, with a 66.6% chance of colliding with the planet, annihilating all life on Earth. This is Armageddon, folks; the real deal. More than ever, we need a hero, ideally of the Bruce Willis variety, to lead an impossible mission and obliterate the meteor before it strikes. And perhaps that’s precisely what the government has planned. Maybe NASA has a contingency for such an event (although I doubt it); a secret stash of nukes, or an untested experimental device that’ll deflect Ardor. A laser defense system. Something. But that’s not what Tommy Wallach’s novel is about. We All Looked Up doesn’t examine the wider picture. It’s not concerned with mankind’s salvation, or our world leaders’ anti-asteroid machinations. Refreshingly, Wallach turns the spotlight on four Seattle-based High School students, whose hopes and dreams threaten to dissipate with their looming demise, and whose separate paths intersect as that damned sparkling speck in the sky approaches. This is an inherently personal story wrapped up in an end-of-the-world plot, and a truly delightful read. Teenagers live such complicated and convoluted lives, usually of their own making, simply because they don’t know any better. At that stage of life, choices are made based on instinct rather than experience, and more often than not a cooler head is required to navigate life’s challenges. The four characters in We All Looked Up – Peter, Andy, Eliza and Anita – are all manifestations of the different spectrums of young Americans, but Wallach’s too good to allow them to become caricatures of their ‘type.’ If anything, these kids are conscious of their stereotype, and how close they are to becoming typecast in their roles. The approaching apocalypse grants them the freedom to reach beyond these boundaries: to be who they want to be, rather than follow the path they’ve found themselves on. Wallach handles the YA requisites with aplomb. There’s romance, of course, and friendships forming and straining in these extreme circumstances; heart-warming and heart-wrenching moments punctuate the chapters as the narrative flicks between the four characters, exposing their innermost thoughts. But inevitably there’s a darker edge to We All Looked Up; this is a story about the end of the world, after all. Wallach provides glimpses into the ways in which society is deteriorating, and the malicious turn impending doom forces upon some of the population. Our core quartet is not immune to the evil permeating mankind’s souls, and the culminating pages are heart-wrenching as the reality of their situation hits home: everyone does not make it to D-Day alive. 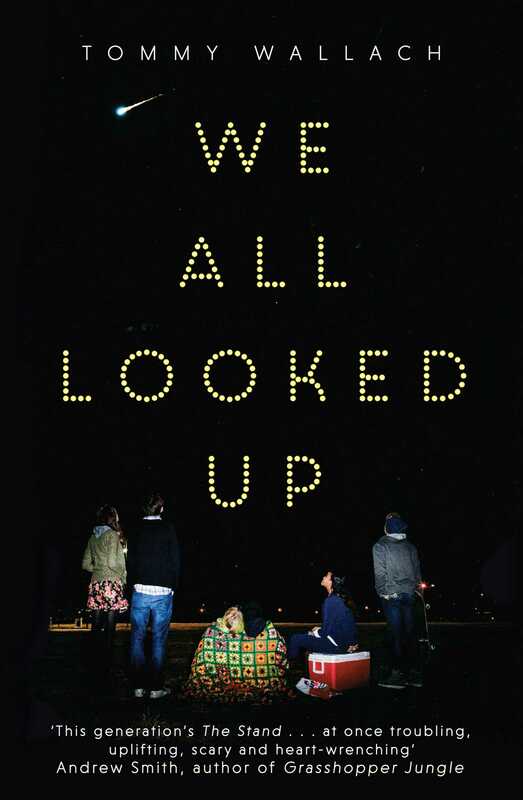 We All Looked Up was an unexpected pleasure – and I say ‘unexpected’ only because I was dubious about the possibility of another soulless apocalyptic story. Wallach’s novel is certainly not that. It has plenty of depth, and is infused with a wonderful cast. A brilliant debut.